Career In Big Data Hadoop offered by leadings companies for Beginners. 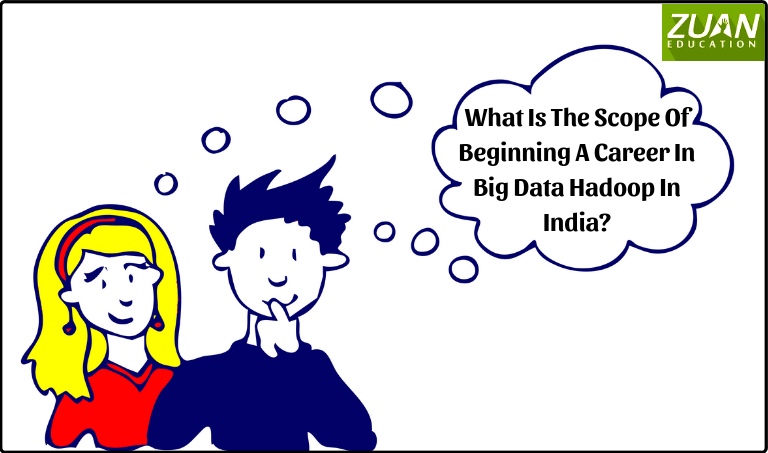 What is the Scope of Beginning a Career in Big Data Hadoop in India? Do you know that 91% of data available today was created in the last three years. Therefore, you have fresh opportunities for a career in Big Data Hadoop to handle such enormous Big Data analytics. And also in other Big Data technologies. You need to know other stats too. Around 500 million tweets are sent every day. Likewise, VISA handles around 150 million transactions per day. For this reason, there is a huge scope of career in Hadoop. Also, a huge demand for Hadoop developers and administrators. If you are a regular user of the internet you would have stumbled upon many websites using Hadoop. For example, Facebook, eBay, Etsy, Yelp, Twitter and Salesforce use Hadoop. Furthermore, they use Big Data Hadoop to analyze the terabytes of data that is being generated. Significantly, it is understood that getting Hadoop certification is needed for a career in Big Data Hadoop. Also gaining skills in Hadoop will boost your chances of getting jobs in the field of Big Data. Several leading companies can offer you a career in Big Data Hadoop. In the first place, Amazon is the top job poster if you have Hadoop skills. Significantly, you can get a job as a software engineer, database administrator, and developer. Furthermore, in Amazon, you are required to lead teams developing distributed storage systems. Equally important, at Amazon you are required to build new APIs. Furthermore, they have jobs for a host of skill sets in Big Data Hadoop. Career in Big Data Hadoop is also offered by eBay. Furthermore, eBay is also committed to Hadoop. It recently built its search engine with Hadoop foundation. Moreover, Yahoo is also an recruiter if you are searching for a career in Big Data Hadoop. In Yahoo you have job opportunities in the search field. Also in content platform group and in its overall application development. On the other hand, Apple is heavily investing in Hadoop and offering career in Big Data Hadoop. Here you have job scope as an iOS Hadoop engineer to build the next generation Apple Cloud services. Currently every major IT company like, Facebook, Jabong, Snapdeal, Amazon etc.., are using Hadoop to convert zettabytes of data created. According to a Global Recruiting Fir, Randstad, the average salaries for big data analytic professionals are 50% more. This is in comparison to other IT professionals. The average salary for Big Data Hadoop analytic professionals in the non-managerial role is 8.5 lakhs INR. As a manager, you can earn an average of whopping 16 lakhs. These average salaries are merely big data skills like Hadoop and spark. If you are a skilled professional with deep analytical talent the salaries are even higher-data scientists. Moreover, under the non-managerial roles, you earn an average salary of 12 Lakhs. As managers, you can earn an average salary of 18 lakhs. To emphasize, IT professionals with 10+ experience in Big Data Hadoop can grab a handsome salary package of more than 1 Crore. Hope these salaries ring as sweet music to your ears. What Companies Look For While Hiring Analytic Professionals In India? You are required to have knowledge of Hadoop, Spark, Scala, Python, R NoSQL and traditional RDBMS’s. Moreover, a strong foundation in Math and Statistics. Furthermore, other talents expected from you are, problem-solving skills, intellectual curiosity, and business acumen. These skills can take you a long way in big data and data science disciplines. Your other technical skills in map reduce and programming languages is also a valid requirement. This article is just to help you kick start your career in Big Data Hadoop. Equally important, India is leading in all the aspects of Information Technology and Big Data Hadoop is definitely one among them. Therefore, why should you miss the scope of getting lucrative careers in Big Data Hadoop? Furthermore, you can also learn Hadoop course in Chennai from reputed IT institutions if you are put up anywhere around the city. To say it in simple terms: self-esteem is very own opinion with regards to you. You know so much its almost tough to argue with you. Great stuff, just excellent! this board and I find It trulʏ useful it helped me out much.